Harvey Nichols’ Retro Style Window Frontage wows in Knightsbridge. 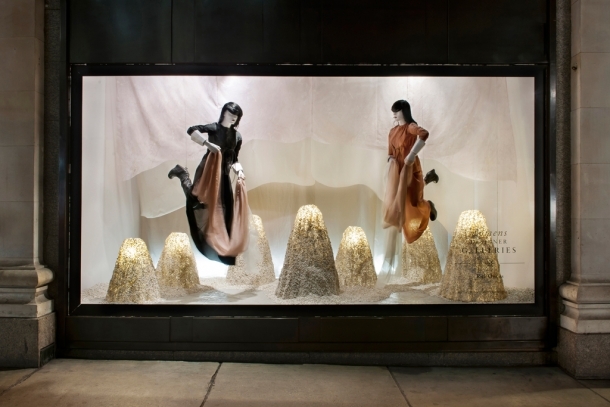 During the late 1980s, Harvey Nichols, under the visual direction of the now famous Ms Mary Portas, was famed for it’s ground-breaking originality in visual merchandising that set trends throughout the globe. 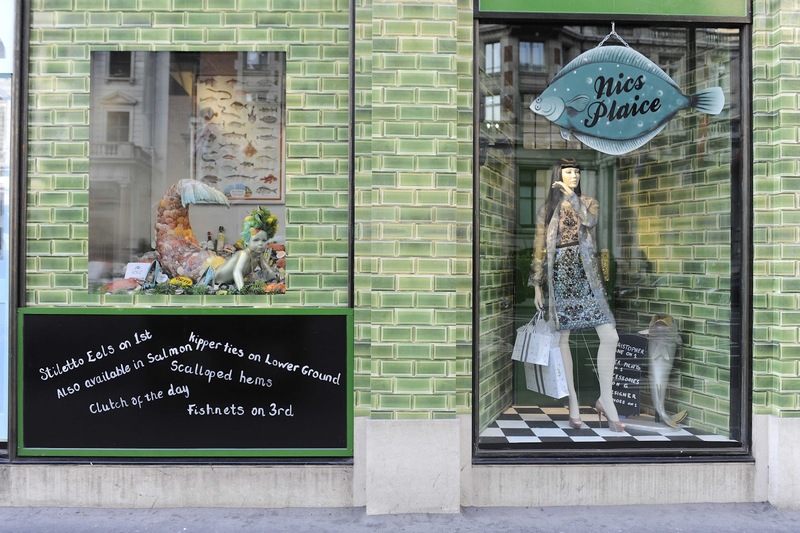 It was the mecca for creativity, highlighting niche designers in new ways and making sure it was always on the list of must sees on the window-shopping route. This was the start of the era of using VM to not only sell your wares and promote your points of product difference but brand your store, by creating a storm. 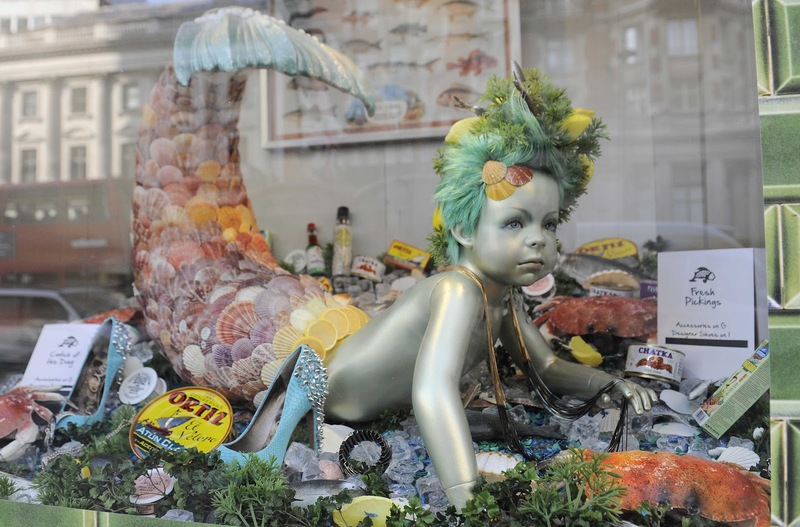 Since then, Harvey Nichols has had some spectacular hits and misses throughout the years, sometimes tying albeit it loosely to their controversial ad campaigns (ie. the digital ‘Walk of Shame’ ad), either getting it right on point or missing the mark and allowing Selfridges to romp home ahead of their closet competitor, in terms of originality, innovation and creativity. 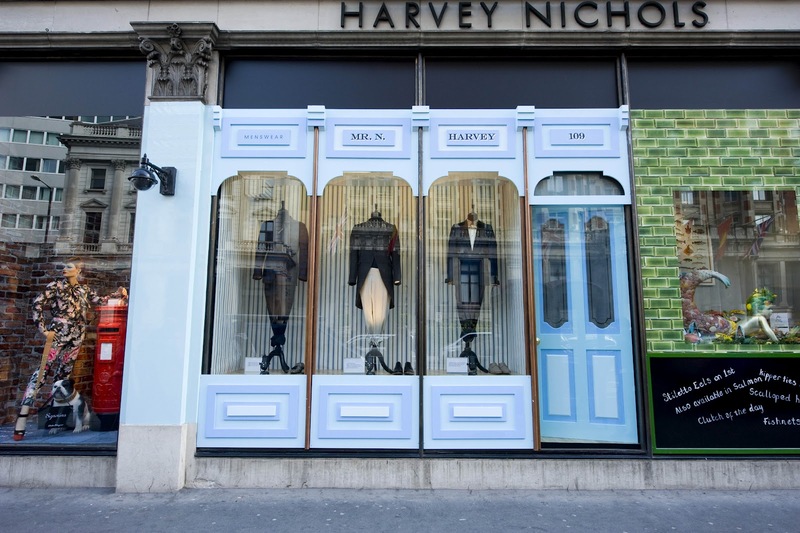 However, Harvey Nichols have hit a home run in their latest ‘General Stores’ window launch under the direction of Janet Wardley, Head of Visual Display. 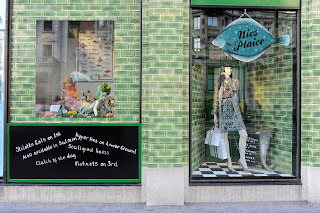 Harvey Nichols normal store frontage has been transformed into a series of vintage stores with signage such as ‘Corner Shop’, ‘Harvey Nickers’ and ‘Nic’s Plaice’ (a false fishmongers) and has even added the street-sign, ‘Fashion Walk, SW1’. The beauty of this move is the brand has managed to regain their edge by combining humour, pastiche and a retro feel in a Diamond Jubilee season as well as making them a stop and stare spectacle. This is feelgood fashion with VM originality in heaps. Veering off to W1, the alternative Church of Consumerism, Selfridges, have cleverly focused, not only on promoting small exclusive designers, big brands and new launches including many large perfume exclusives, but have managed to ‘own’ the connection with contemporary art and have become synonymous with highlighting new talent in this field as well as digital and design. Smart move. With brands’ multiple cross links this is a fertile area instead of the usual down pat ‘celebrity’ brand link which has oft become a byword for desperation. 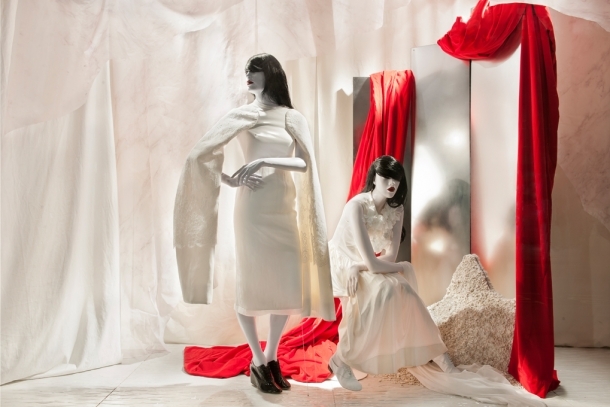 Currently, Selfridges window frontage takes inspiration from the stores neo-classical architecture and curations with cutting-edge collections from Haider Ackerman, Rick Owens, Maison Martin Marghiela, Comme des Garcons, Gareth Pugh and Ann Demeulemeester. We only have to look at Louis Vuitton’s avante-garde Nowness website to see the vast array of fashion links with art, music, architecture and literature as well as the cerebral celebrity to see the direction that visual merchandisers and labels must now seek, to give consumers added meaning and justification for their brand purchase decision. These websites serve as digital shop windows for their brands, showing they have greater depth with their associations. 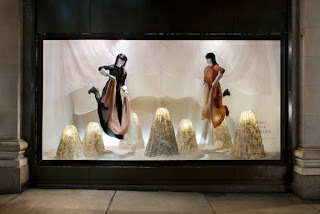 It is the forward thinking and daring retailers, websites and labels (Joyce.com, Burberry, NetaPorter, Dolce & Gabbana’s digital magazine, Swide, and the simply brilliant and informative style.com and showstudio.com who are willing to make the leap beyond pure fashion and celebrity for the thinking consumers’ choice. These are more than digital magazines and labels, they are major influencers in cultural direction. As such, visual merchandisers must work harder and take risks to capitalise on creativity to transform their 24 hour advertisement windows into sales and brand resonance.